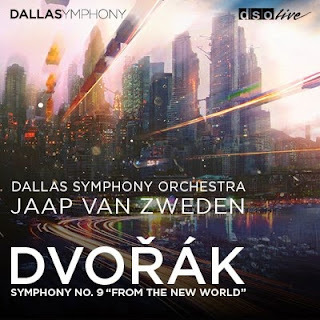 Music Director Jaap van Zweden and the Dallas Symphony Orchestra (DSO) announce the release of Dvořák’s most popular and iconic work, Symphony No. 9, From the New World. The concert performance is now available as a digital download via iTunes, Amazon.com and other digital service providers. The recording is the sixth by Jaap van Zweden and the Dallas Symphony available on the DSO Live label. This recording is supported in part by the Nancy P. and John G. Penson Dallas Symphony Orchestra Recording Fund. Popularly called the New World Symphony, Dvořák’s Symphony No. 9 was recorded live in concert January 16-18, 2014 in the Eugene McDermott Concert Hall of the Morton H. Meyerson Symphony Center in Dallas performed by Jaap van Zweden and the Dallas Symphony. Of the performance, Scott Cantrell of The Dallas Morning News said, “The playing was amazing. To hear … was yet again to marvel at the wonders van Zweden … has worked with the orchestra.” Gregory Sullivan Isaacs on TheaterJones.com wrote, “It was revelatory…An exciting and memorable … performance.” “We wanted to release this recording of Dvorak’s ‘New World’ Symphony to coincide with the SOLUNA Festival and its theme Destination America,” said Jonathan Martin, President and CEO of the Dallas Symphony. “Dvorak’s use of folk themes from his time in America is beautiful and haunting, and it is this influence of the new land on this Czech composer that reflects the spirit of SOLUNA’s theme.” The album may be purchased at iTunes starting today at www.iTunes.com/DSONewWorld and at other digital retailers.